Many of the user interface design principles you have learned concerning feedback also extend to designing ecommerce Web sites. A few extra considerations shown in this section can give your Web interface designs improved functionality. Not only do you need to give users feedback about what is happening with an order, but you need to elicit feedback as well. Most ecommerce Web sites have a Feedback button. There are two standard ways to design what users will experience when they click on the Feedback button. The first way is to launch the user’s email program with the email address of the company’s contact automatically entered into the To: field. This method prevents typing errors and facilitates ease in contacting the organization. The user does not need to leave the site to communicate with it. These messages, however, raise expectations that they will be answered just as regular mail or phone calls are. Research indicates that 60 percent of organizations with this type of email contact feature on their sites do not have anyone assigned to reply to the email messages received. Thus, the business is losing valuable feedback, allowing customers to harbor the impression that they are communicating, and engendering ill will when no response is received. If you design this type of feedback opportunity, you also need to design procedures for the organization to reply to email from the Web site. Some designers handle this problem by creating systems to automatically return an email reply, which generates a unique case or incident number, provides further instructions on how to proceed (hyperlinks to FAQ pages perhaps), or offers phone numbers to help lines that are unavailable to the general public. Fields can include First Name, Last Name, Email Address, Regarding (a subject field that supplies a drop-down menu of the company’s product or service selections, asking the user to “Please make a selection”), an “Enter Your Message Here:” section (a free-form space where users can type in their message), and the standard Submit and Clear buttons at the bottom of the form. Using this type of form permits the analyst to have the user data already formatted correctly for storage in a database. Consequently, it makes the data entered into a feedback form easier to analyze in the aggregate. Thus, the analyst does more than just design a response to individual email. The analyst helps the organization capture, store, process, and analyze valuable customer information in a manner that makes it more likely that the company will be capable of spotting important trends in customer response, rather than simply reacting to individual queries. Many authors speak of what is known as “intuitive navigation” for ecommerce Web sites. Users need to know how to navigate the site without having to learn a new interface and without having to explore every inch of the Web site before they can find what they want. The standard for this type of navigational approach is called one-click navigation. There are four ways to design easy, one-click navigation for an ecommerce site: (1) creating a rollover menu, (2) building a collection of hierarchical links so that the home page becomes an outline of the key topic headings associated with the Web site, (3) placing a site map on the home page and emphasizing the link to it (this would also be placed on every other page on the site), and (4) placing a navigational bar on every inside page (usually at the top or on the left side of the page) that repeats the categories used on the entry screen. Creating an outline of the content of the site through the presentation of a table of contents on the home page is another way to speed navigation of the site. This design, however, imposes severe constraints on the designer’s creativity, and sometimes simply presenting a list of topics does not adequately convey the strategic mission of the organization to the user. Designing and then prominently displaying the link to a site map is a third way to improve navigational efficiency. Remember to include the link to the site map on the home page and on every other page as well. Finally, you can design navigation bars that are consistently displayed on the home page as well as at the top and on the left of all other pages that comprise the site. Once you have established (during the information requirements phase) the most useful and most used categories (usually categories such as “Our Company,” “Our Products,” “Buy Now,” “Contact Us,” “Site Map,” and “Search”), remember to include them on all pages. Including a search function is another option. Include adding a search engine such as Google to your site. Simple search functions work well for small, manageable sites, but as a site grows large, advanced search functions that include Boolean logic (discussed later in this chapter) are needed. Creating flexibility in the way users navigate the Web is also important. An expert Web site designer would try to incorporate many different ways to look up information on a particular subject. Figure below shows a Web page from a website. For example, a user interested in an international IT career can find out information from the Web site in three different ways. 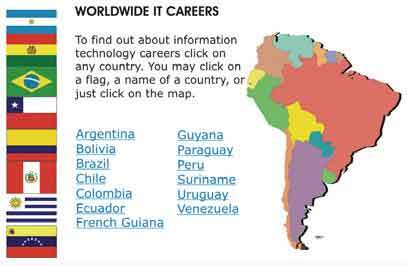 If they are interested in working in Argentina, they can click on the Argentine flag, click on the name of the country, or click on the map representing Argentina. An example of a Web page that allows users to navigate to the desired page in different ways. Designing a Web site with navigation for users with different cognitive processing or interests is desirable. It is even possible that the same user may use all three of these methods at different times. All of these add to the usability of a Web site. The main priority in navigation is, however, that, whatever you do, you must make it extremely easy for users to return to a previous page and make it somewhat easy to return to the place where they entered the client’s site. Your main concern is keeping customers on the Web site. The longer customers are on the site, the greater the chance is that they will purchase something. So make sure that, if users navigate to a link in your client’s Web site, they can easily find their way back. Doing these things will ensure the stickiness of the Web site. Do not create any barriers to the customer who wants to return to the client’s Web site. An application programming interface (API) is a set of small programs and protocols used like building blocks for building software applications. When two or more APIs are used together they form a mashup. Many mashups are open source, so developers can use an API from a site like Google Maps and combine it with an API that contains other data, resulting in a new Web site that creates an entirely new application. Bogozo Real Estate, for example, combines CraigsList real estate data with Google Maps. This new application allows a user to see properties displayed on a map, view the location of neighborhood schools, and in the specific case of New York City, see an overlay of a New York City subway map to help buyers find a place convenient to the subway system. A large corporation that has many retail outlets in a region may want to make it easier for customers to find their retail stores. They may want to hire a company like Blipstar, which provides a service that allows companies to upload information about retail stores. Blipstar geocodes them and places them on a Google map. The company then puts a link to this information on its own Web site, so customers can simply enter their zip or postal code and let the mashup display the location of the nearest retail store. Mashups are becoming a new way to present information. Expect to see many useful mashup applications soon. Look for them at www.programmableweb.com.